Adapted from a very old poem by author Elizabeth Cheney back in 1859. I was unable to locate any additional information about the author, but you can read below the lovely story of what inspired me to create the design. This is one of those designs that was actually inspired by a stitcher who contacted me out of the blue to ask me if I had ever heard of this poem. All she could tell me is that she remembered stitching a very old cross-stitch version of this poem many, many years ago. She explained that she had stitched it for her grandmother (back when she was a pre-teen over 50 years ago). When her grandmother passed, the piece passed on to her mother. The circle of life came again, and it has now come back to her (the original stitcher). She contacted me because she would like to stitch it again for other family members. She thought I might be helpful in pointing her in the right direction to find the chart. So, I did a little research to see if I could find anything. It just so happened that I did locate a picture (Pinterest) of this design that was created during the 1960s. Bottom line, I loved the poem and it struck a chord with me. I decided to design something myself. 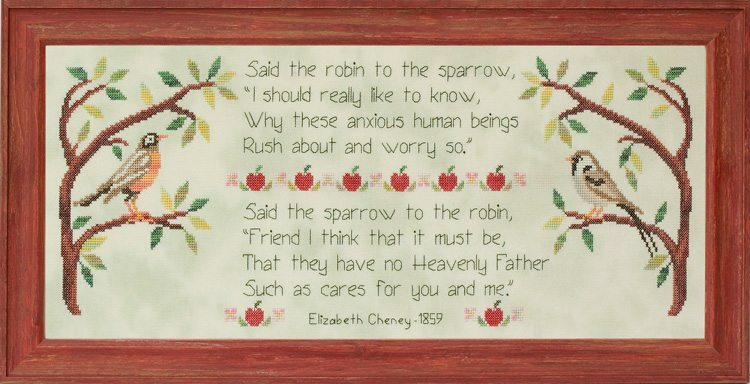 The poem was written by Elizabeth Cheney back in 1859. Unfortunately, I could not find out any other information about the author. I found the poem in many, many different posts, but never anything more about the author. So that part of it remains a mystery to me. General Information: Stitched using 1 thread of floss over 2 threads of fabric. Fabric: Stitched on 28ct Hand-Dyed “Queen Anne’s Lace” Jobelan by Wichelt Import. Fibers: Uses a total of 17 colors of Sulky 12 wt. Cotton Petites thread. NOTE: Although Sullivans/DMC/and Anchor comparables have been provided, it is important to realize that these are “best match” colors and may not be exact matches. In addition, solid colors of Sullivans/DMC/and Anchor have been selected in lieu of using the Sulky blendables. Blendables are similar to a variegated floss.